Walking along Church Street at 14th this afternoon, I watched a SFPD officer quickly do a U-turn and issue a citation to a cyclist that had unsafely used the crosswalk to cross Church Street; causing several pedestrians to dodge and scatter. 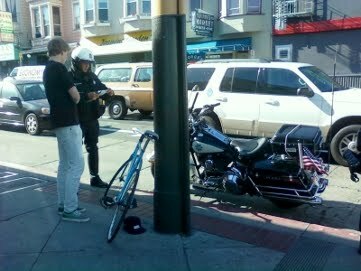 It is encouraging, as one who is a daily bicyclist, pedestrian, and car operator in the city, to see our SFPD officers begin to apply the same rules to cyclists, as they do to motorists. As a driver and pedestrian, i continually watch as bicyclists brazenly ignore not only stop signs, but red lights. As a rush hour cyclist along Valencia Street, I witness countless numbers of fellow cyclists run red lights, use the crosswalk without dismounting, and perform 'right on red' with no regard for pedestrians with the right of way. This flagrant disrespect for not only others, but the law, put pedestrians in harms way. A roughly 150 - 200 lb. bicycle (operator included) traveling at 10 miles an hour could inflict notable injury on a child or elder pedestrian. The cycling lobby has continually fought Mr. Anderson's lawsuit (and the resulting injunction) to lobby for safer streets for all modes of conveyance. Newly striped dedicated bike lanes are popping up all over the city, making San Francisco again the leader in progressive ideals. It seems to me that since we have gotten the policy change we've worked so hard to get, it's time to do our part. Obey the law, be engaged in your surroundings (cell phones, headphones) and please, start stopping at traffic signals. Who knows, maybe a kind driver will surprise you and wave you through a 4-way stop, simply because you selflessly made the attempt to slowly approach and assess the intersection responsibly. No one mode of transportation is better than any other, we are all equal at an intersection.